Dates for both the Festival of Speed and Revival meetings in 2015 have been confirmed. The Festival of Speed, which celebrates the very best from the past and present of motoring and motor sport, will be held on 25-28 June, 2015. As usual, the event will open with the Moving Motor Show on Thursday, 25 June. Alongside the overall theme of ‘Fast and Fearless: Racing on the Edge’, the Festival of Speed will also celebrate the 90th anniversary of the motor racing’s inaugural World Championship, won by Alfa Romeo, and mark 50 years since Honda’s maiden grand prix victory as the Japanese manufacturer returns to Formula 1 with McLaren in 2015. 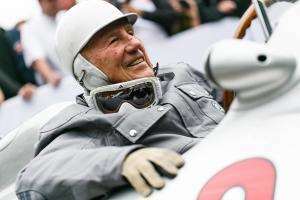 The event will also pay tribute to the 60th anniversary of two sensational victories; Sir Stirling Moss (picture left) and Denis Jenkinson’s triumph on the 1955 Mille Miglia and the first post-war grand prix win for an all-British line-up; Tony Brooks in a Connaught at Syracuse. Sports car legend Derek Bell will be honoured as 2015 marks the 40th anniversary of the first of his five Le Mans 24 Hours wins, which came behind the wheel of a Mirage-Ford. The Goodwood Revival, firmly established as the world’s largest and most popular motor racing and vintage culture event, will take place on September 11-13, ensuring neither event will clash with the Formula 1 World Championship calendar. The Revival will pay tribute to the legendary driver, engineer and racing car constructor, Bruce McLaren, with a special parade of vehicles associated with his career. Tickets and hospitality packages for both events are on general sale, as are a limited number of tickets for the 73rd Members’ Meeting, which will be held on 21-22 March 2015. Have you secured your FoS and Revival tickets? Click here! FoS gallery: Do you mind if we smoke?